The TESTme kit has been designed to be simple to use. It will be posted to you – don't worry it won't say anything about sexual health or MSHC on the outside! Inside the kit are clear instructions, swabs and containers. The tests are simple to collect and won't hurt at all. 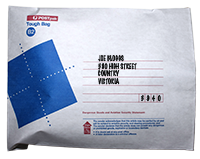 There is also a reply paid envelope so that you can send everything back to us. In the kit there is a questionnaire. We would really appreciate you filling it in and sending it back with your specimens so that you can tell us what you think of TESTme so that we can improve as we go along. Tests for Gonorrhoea and Chlamydia. Blood tests are not included.